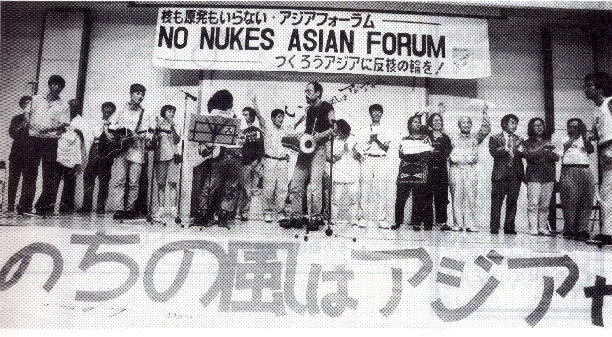 This year marks the 10th year since No Nukes Asia Forum (NNAF) was established. The NNAF is aiming for an Asia without nuclear weapons or nuclear power plants. Our Forum usually invites eight to ten Asian countries and regions each year, and is hosted by a different country each time. In the forum, we have exchanged information (Japan has contributed a numerous reports), shared our experiences, and carried out joint actions. Through these activities, we have built an equal and close network where we have learned from and encouraged each other. A number of people from nuclear power plant sites, planned sites, and candidate sites for nuclear waste disposal participated in the forum from respective Asian nations. Below is a short summary of report in each NNAF. The world has been moving toward phasing-out nuclear power, yet there are still many nuclear power plant construction plans in Asian countries. Japan is the leading country promoting the sale of nuclear power plants. Every year, Japan has hosted the "International Conference for Nuclear Power Cooperation in Asian Region" (Since year 2000, the name was changed to "Asian Nuclear Cooperation Forum," to be hosted by different countries each year). Japan has provided technical cooperation, such as accepting a lot of interns. In particular, with Korea and Taiwan respectively, Japan has held bilateral cooperative conferences every year. In addition, large-scale missions from both public and private sectors have been sent to South East Asia. Responding to this situation, Japan hosted the first NNAF. Mr. Kim, one of the forum founders from Korea said, "The nuclear promotion side has a very close relationship with Japan which is playing a central role. We need to fight against this with our own alliance of Asian citizens." The first NNAF was supported by 1354 individuals and 177 organizations, and a steering committee of 100 members worked hard to prepare for the forum. At the international forum, there were voices of criticism against Japan's plutonium policy and nuclear power plant export policy, such as, "Japan's plutonium policy is raising tension in the Asian region." Thirty participants from Asian countries divided into seven tours to visit and hold meetings in 28 locations all over Japan including nuclear power plants sites. Since Japan has been promoting nuclear power plants to Asian nations by saying, "Japan has been operating more than 40 nuclear power plants safely and local residents are also supporting nuclear power," our tours were very meaningful to inform Asian participants about these many "lies". Through this forum, many acquaintances were made, and they became the very first step toward establishing an international network. During the military dictatorship, Korea constructed nuclear power plants at four sites (Kori, Youngkwang, Wolsung, Uljin). However, since the 1987 democracy movement, especially around 1990, the anti-nuclear movement ran high. Up till now, due to the residents' strong-arm tactics, the establishment of new nuclear power plant sites or a disposal site for nuclear waste has never been realized. At the Seoul NNAF, as was expected, Japan was criticized for having been a barrier for Korean peninsula to achieve de-nuclearization, and for not having solved the Korean A-bomb victim issue, postwar compensation issue and so on. There was a Korean student assembly where Japanese students also made a speech for solidarity. After that, we went for a trip around the South Korean Peninsula on a bus. We also went to the Independent Memorial Hall. At Youngkwang, we carried out a demonstration with farmers and fishermen, and visited the grave of Mr. Ro Yeun-Eup who died after participating in the previous year's forum. In Kwangju, we visited the public cemetery to worship the victims of democracy movements, and carried out a demonstration against the US Culture Center. Then we held a rally at Goseong and Chungha where people successfully prevented the construction of a nuclear waste disposal site. We also held a demonstration and a rally at Kori Urchin nuclear power plant site. A demonstration was also held at the Japanese consulate in Pusan, during which seven Koreans were arrested and the members in the bus were confined in the bus for two and a half hours. Although the schedule of the NNAF bus tour was very tough with meetings and exchanges, we had no time to feel tired with ceaseless opportunities to meet local residents who had been vigorously fighting to oppose nuclear power related facilities. The Korean forum gave us a chance to strengthen horizontal ties with Korean regional organizations and local resident groups. In the following year of 1995, local residents were victorious over the fight against the construction of nuclear waste disposal site at Kureup Island. 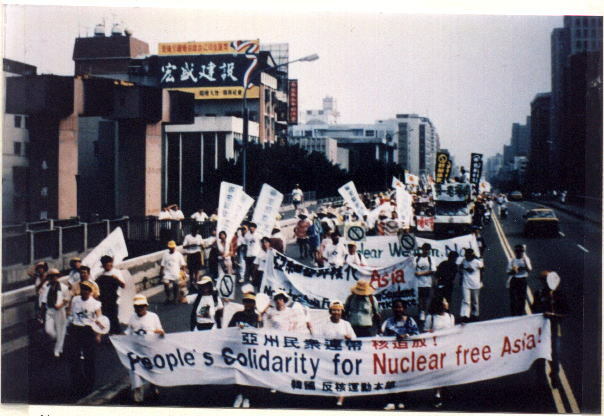 At the 3rd NNAF, a grand demonstration of 30,000 people was held, in opposition to the construction of Taiwan's 4th nuclear power plant and French nuclear testing. People chanted, "Abolish nuclear weapons!" and "No to nuclear power!" Models of nuclear weapons and a nuclear power plant were burnt to the ground in a main street intersection. During the 38 years of the Nationalist Party's dictatorship under the martial law, people were derived of their rights to raise their voices of opposition or criticism, and a total of six nuclear power plants were constructed one after another at three sites with two reactors at each site. In 1987, martial law was lifted, and the movement for democratization was heightened. The main argument of this movement was the opposition against the construction of the 4th nuclear power plant. Among the fight for democratization, Democratic Progressive Party was born with one of their platforms including opposing nuclear power. In the national parliament, the argument of acceptance of the 4th nuclear plant construction was repeated with a number of turnovers. The construction of the 4th nuclear power plant became the biggest political issue in Taiwan. During the conference in Taipei, when a representative of the aboriginal people of Orchid Island pleaded, "Do not make our island a nuclear dump site!," a participant from Tahiti went up on the stage and asked to shake hands. He also appealed for liberation from French colonialism. We closed our forum with an on-site demonstration against the 4th nuclear power plant and exchange with local residents of Kongliao, in which 96% of the people opposed the construction of this nuclear power plant in a referendum. After the NNAF in Taiwan, people in Orchid Island successfully stopped an additional shipment of nuclear waste into their island by strong-arm tactics. They further obtained a commitment from Taiwan Electric, which promised to ship out the 100,000 drum cans of nuclear waste out of their island by the end of 2002. Regarding the issue of radioactive contamination at Min-Sheng Housing, on March 25 in 2002, it was ruled that the government would extend apologies and pay some compensation to the residents. It is often said, "Nuclear power plants are the opposite of democracy." As was the case of other Asian nations, nuclear power in Indonesia had been a symbol of militaristic and developmental dictatorship. In 1990s, Suharto military dictatorship planned the construction of the very first nuclear power plant in Indonesia, Muria nuclear power plant (700MW) in the central part of Jawa Island. The anti-nuclear movement, which meant the same as the democracy movement in those days, was carried out during a very difficult time. Meanwhile, Kansai Electric Power Company conducted a pre-investigation from 1991 to 1996, and there was a heightened possibility that Mitsubishi was going to export. Responding to this, from 1993 to 1997, Japan also conducted a movement against export of a nuclear power plant, called "Stop the Export of Nuclear Power Plants!" Japan also invited Indonesian anti-nuclear power plant activists, including Ms. Mire to send their voices to Japanese society. She later opposed to nuclear power in the national Diet by herself. Japan also carried out a petition campaign, and worked on the Japanese government and the Diet, and frequently visited Indonesia to pass on various sorts of information. It was such a meaningful achievement for NNAF to be able to hold the Forum in the midst of the suppressive environment in which no rallies or demonstration could not be carried out freely. On July 27, only two days before the forum, the headquarters of the Democratic Party was assaulted by a conspiracy of the military, claiming more than one hundred lives. Uproars took place, and the tension had risen. Under such conditions, our forum was carried out in Jakarta, Solo and Yogyakarta. We also visited Baron Village, the planned nuclear power plant site. However, due to the strict supervision of the military and the police, we could not get in contact with the local residents. In this forum, besides the anti-nuke hub of Jawa Island, we had met people from Sumatera, Lombok, Kalimantan, Sulawesi all together for the first time, through which the anti-nuke national network was established. In the following year of 1997, the construction of the nuclear power plant was postponed, even though the Atomic Power Law was established. 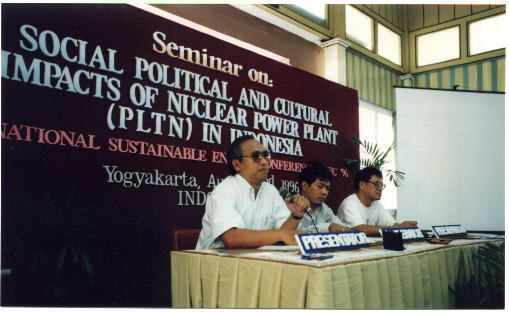 In 1998, as a result of the people's struggles lead by students, the more than 30 year-old Suharto militaristic dictatorship came to an end, leading to the cancellation of the nuclear power plant plan. The Bataan nuclear power plant was constructed under the Marcos military dictatorship tainted with self-interest and corruption. 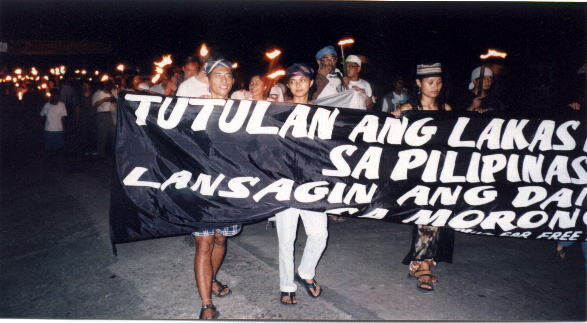 Though the fight of Bataan residents had been severely oppressed in the late 1970s, the movement to stop the start of Bataan nuclear power plant was developed, and in 1985, a three day general strike was carried out with participants calling for "Anti-Marcos and anti-nuclear power plants." The city was filled with 50,000 Bataan residents, who fought against military tanks and armored vehicles. This lead to the People's Power Movement in February 1986, which toppled the Marcos regime. The movement against anti-nuclear power movement combined with the democracy movement. The Bataan nuclear power plant was suspended right after the Aquino administration was established. Thus, it was decided that the only Philippino nuclear power plant, the Baatan plant, would not operate even though it had already been constructed. Moreover, the people in Philippines were successful in ousting the US militaries with their Non-Nuclear Constitution. However, the Philippine government planned the resumption of the Bataan nuclear power plant since 1992, and it also announced nuclear power plant construction plans in ten different sites including Luzon, Mindoro, Negros, and Mindanao islands. During the 1997 NNAF, we went to the site of Bataan nuclear power plant, after holding a conference in Manila and visiting the Nuclear Power Institute. Though it was 11:30 p.m. when the bus arrived, a lot of residents welcomed us clapping and chanting, "No Nukes! International solidarity!" Then there was a demonstration with 2000 people holding torches. The passion, self-assurance and confidence of the Bataan people tremendously empowered the participants from other parts of the Philippines and overseas. People in the Philippines defined the exports of nuclear power plants as the "New Type of Aggression". In 1998, the following year, the government decided not to construct any more nuclear power plants. The Thai government established the "21 Members' Commission," and started its nuclear power plant construction plan. From 1997 to 1998, Electricity Generating Authority of Thailand (EGAT) promoted nuclear power using mass media, and started to buy land around the planned sites after completing a pre-investigation of the three candidate sites in southern Thailand. The organizer of the Forum was a Thai anti-nuclear NGO called "Alternative Energy Projects for Sustainability (AEPS)". There were discussions regarding renewable energy in the two day conference in Bangkok. On the third day, the bus went down 600 km heading for Chumphon, a southern part of Thailand. A rally was held in a temple on a beautiful beach near the planned site of a nuclear power plant, and 200 overseas participants told the local residents about dangers of nuclear power plants and their anti-nuke movement experiences. At the end of the rally, a local woman said, "No matter what happens, I will never sell my land." We also visited Surat Thani, another planned site, in which another vigorous discussion was exchanged with local NGOs and residents in the rally. Both Chumphon and Surat Thani are the sites where mangrove forests were destructed for shrimp cultivation for export to Japan. After that, we headed for Ongkarak, 60km north east of Bangkok, where a 10MW nuclear power plant was going to be constructed. In 1996, GA, a US company, successfully made a bid and designed the plant, and Japanese company, Hitachi, was going to manufacture the plant. Old men and women in the quiet village, along with the members of AEPS have been opposing the construction. In February 2000, a Cobalt 60 exposure accident took place in a suburb of Bangkok. A used medical irradiation machine was brought to a steel scrap manufacturer. This accident resulted in the deaths of three people exposed to radiation gave a tremendous shock to Thai people. In March, 700 residents in Ongkarak visited the government, and obtained a promise from the Minister who said, "We will not construct an experimental reactor without the consent of local residents." Thus, the construction of a nuclear power plant in the southern part of Thailand and the plan of Ongkarak experimental power plant are currently suspended. India has all kinds of nuclear facilities from uranium mines to a reprocessing plant and even nuclear weapons test sites. In the Forum, we had participants from the sole national uranium mine Jadugoda, and there were exchanges of people who were against large-scale development in various areas. Accordingly, the Forum became a very fruitful one covering the issues of not only nuclear power, but also renewable energy, forest protection, opposition against dam constructions, etc. In addition, the issues of Pakistan and Middle East nuclear issues were tabled, which gave the participants very real concerns regarding the geological and political situation in India. During the field trips, the participants exchanged views with local residents who kept living in a village, half of which was submerged under the water due to the construction of a lake dam for pumping up cooling water for the Kaiga nuclear power plant. Mr. Gansyam Biruri from Jadugoda who made a final speech for the Forum pleaded about the tragedies of the residents suffering from the contamination of the Jadugoda uranium mine, and said, "We have to make concrete actions for victims of radiation in various parts of the world." His remarks made an impressive closing and gave a powerful message to the participants. In Tokyo, besides holding a symposium, negotiation took place with the government on the export of a nuclear power plant to Taiwan, and a demonstration was held in front of Hitachi headquarters, opposing nuclear power plant export, and a demonstration took place in front of Ministry of International Trade and Industry, opposing Japan's pluthermal program. In Tokaimura at a symposium about the JCO accident, participants heard about the vivid experiences of local residents. Also, there was a slide show about the Cobalt 60 accident in Thailand and reports from Bukit Merah village from Malaysia on the radioactive contamination caused by Mitsubishi Chemical Co. In Fukushima, a symposium on the theme of nuclear waste and MOX was held. The situations of struggles from Fukushima (Japan), Aomori (Japan), Korea, Taiwan and Australia were introduced, and there were lively discussions. After the Women's Forum, we visited Maki town, and local residents of a planned nuclear power plant site welcomed us. The symposium called, "Toward the Era of the New Energy" was also successful, and we had an urgent appeal from Taiwan, to which an Advanced Boiling Water Reactor, the same type as that of Kashiwazaki was going to be exported. At the international conference in Jyonobi village, there was a report from various local areas from Hokkaido (the northern part of Japan) to Kagoshima (the southern part of Japan). After working together for one week, we felt as if we had been comrades for a long time. The Sayonara party hosted by local people in Nigata ran high with songs and dances of various countries. 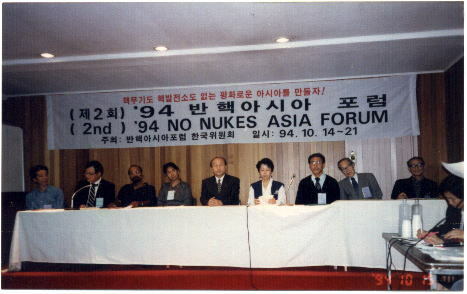 The reason Korea was chosen as the next host country in the 8th NNAF was that it was predicted that the summer of 2001 would be a critical time for the struggle against the construction of the nuclear waste dump site in Korea. During the past ten years, nuclear promoters had forcibly chosen potential nuclear waste disposal site such as Anmyong Island, Tokchok Island, etc. However, each time they faced fierce opposition from local residents. As a result, the plans had been turned down nine times in a row. After that, promoters switched their strategies to officially seek a candidate site offering a 25 billion yen support fund for the local community with a dead line at the end of June 2001. There were vigorous promoting operation in several cities, but the plan was never realized in any place due to the strong opposition movements. It is believed that the promoters will resume the assertive selection of sites in 2003 after the presidential election. Accordingly, our forum did not coincide with any mass demonstration against the stronghold selection of a nuclear disposal site. Currently, there are 16 nuclear power plants under operation at four different sites. There are two nuclear power plants under construction at Youngkwang and Uljin, and another 16 are in the planning stage. This figure is quite extraordinary worldwide. We visited Youngkwang nuclear power plant after the conference and held a demonstration in the street of Seoul. Youngkwang is said to be the most probable nuclear disposal site. A rally called "No to Nuclear Disposal Site! Cultural forum of the County People in Youngkwang" was held. The atmosphere was very good with songs, traditional music and dancing. There were many people who visited from Kwangju. There was a demonstration by 800 people in front of Ulsan nuclear power plant, in which another nuclear power plant is planned to be constructed in spite of the finding an active fault in the nearby area. There was also a very strong demonstration with 500 people in Ulsan, in which a number of city councilors and also modern automobile labor union have been fighting for anti-nuke along with citizens and local residents. 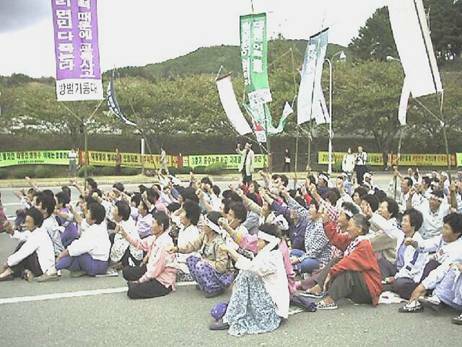 Immediately after the Forum, a sit-in was carried out to stop the loading of nuclear fuel into Units 5 and 6 of the Youngkwang nuclear power plant. Also in Ulsan nuclear power plant planned site, local residents successfully achieved the cancellation of the environmental assessment explanatory meeting. 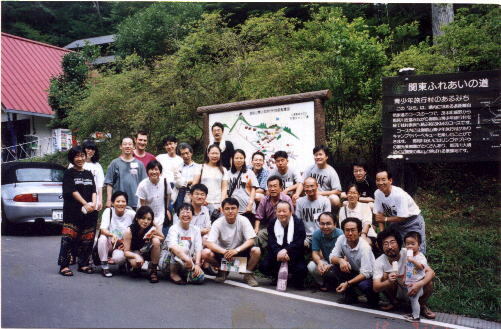 In November, having led by the participants of the Forum from Urchin, the anti-nuke movement against the construction of 7,8,9 and 10 was heightened. The Forum was successful in a way that we were able to communicate with local people with mutual encouragement.